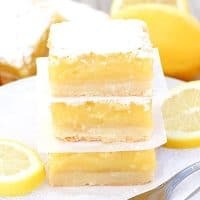 THE BEST LEMON BARS — A sweet shortbread crust is topped with a thick layer of luscious lemon filling, then dusted with powdered sugar for practically perfect lemon bars. I’ve tried a lot of lemon bars in my day, and I’ve always been a little bit disappointed in the crust to lemon filling ration–until now! These really are the Best Lemon Bars I’ve ever had! Just check out that thick layer of lemony goodness! It’s the reason these lemon bars are the best, in my opinion. These really are the best lemon bars ever! I made this New Years resolution to try 200 new baking recipes this year. With that much baking, my goal was NOT to repeat ANY recipe. And my whole family agrees. They can hardly wait for these bars to cool before they dig in. 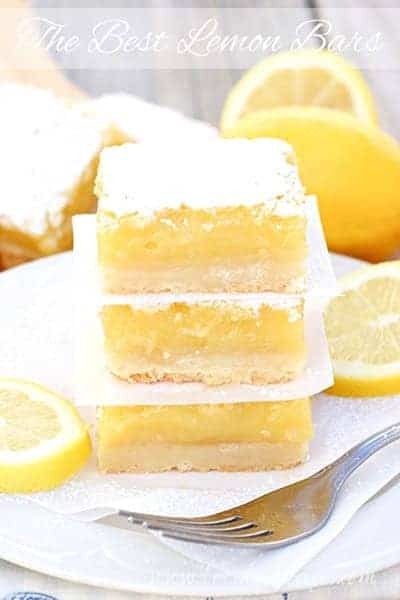 To me, a good lemon bar is the perfect dessert for almost any spring occasion, which makes these lemon bars a perfect choice for almost any spring occasion. You can never go wrong serving lemon bars at an Easter brunch or buffet. 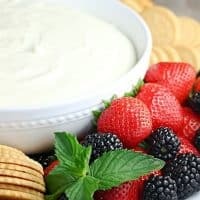 If you won’t be feeding a crowd (or several teenage boys), this recipe can be cut in half easily. I definitely recommend using the parchment paper trick. 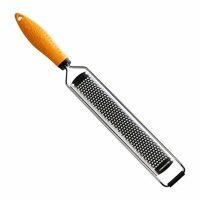 It makes removing the bars from the pan and cutting them so much easier. A sweet shortbread crust is topped with a thick layer of luscious lemon filling, then dusted with powdered sugar for practically perfect lemon bars. 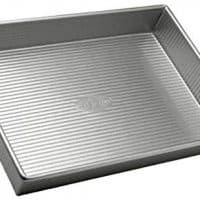 Butter a 9 x 13 baking pan, then line the bottom and sides of the pan with parchment paper. This is optional but will make removing the bars from the pan much easier. 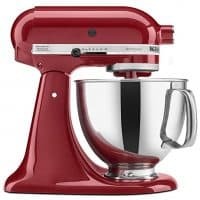 Make the crust by creaming the butter, sugar and salt in the bowl of an electric mixer until light and fluffy. Stir in the flour. Using your hands, press the dough into the bottom of prepared pan. Chill the pan while the oven preheats to 350° degrees. Bake the crust for 12-15 minutes, until very lightly browned. Let cool on a wire rack. Leave the oven on. Whisk together the eggs, sugar, lemon zest, lemon juice, and flour. Pour the lemon mixture over the crust and bake for about 35 minutes, until filling is set. Let cool to room temperature, then refrigerate at least one hour. Cut into squares and dust with confectioners’ sugar. Store any leftovers in a covered container in the refrigerator. Who Dished It Up First: Monica over at Lick the Bowl Good. 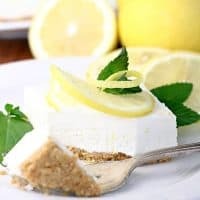 I love lemon recipes too! The lemon layer looks so thick and delicious! Dang gena look at all that butter, haha 🙂 But these do really look good! So glad you made these. It’s one of those recipes I wish I could force feed to people just to make themtry them so they’d know how good they are. haha! I also loved how thick the filling was. yum! You’ll definitely have to try them mixed with the lemon zest in there- so tangy! The 1 cup of flour is a lot in the lemon mix. It isn’t a typo? Loveee lemon.. This looks delish! OMG, yummy! I often forget that I like lemon bars, but then I get reminded every now and then. Those look so good! These look sooo yummy! 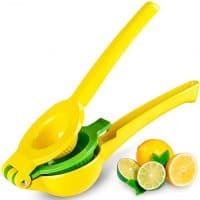 I love anything with lemons! I am making this now. I just put it in the oven and the crust is totally floating to the top. I don’t know what went wrong. These are for my son’s birthday party tonight and I want to cry. Did you bake the crust first for about 15 minutes? If so, I’m guessing they might still be fine. The top gets a very crusty looking layer, and that may be what you’re seeing. It might not be the crust at all. I’d let them finish baking and see what happens. If not, the only thing I can think that would cause that is not pressing the crust into the pan firmly enough, or not pressing it all the way to the edges. 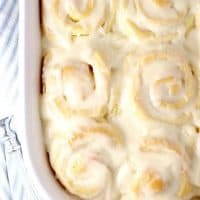 Damielle, I tried making these and the filling was way too runny – maybe I forgot to put the flour in the lemon batter? Do you have trouble with this? 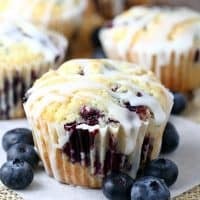 Danielle, I tried making these and the filling was way too runny – maybe I forgot to put the flour in the lemon batter? Do you have trouble with this? The filling is quite runny before baking, but once it is baked they should firm up nicely, especially once cooled. If it is still runny after that you may have missed an ingredient, or not baked them quite long enough. Wow! These bars are fabulous! They came out perfect! Great recipe – Thank you!! These were delicious. I used Meyer lemons, over the top rich and lemony. I made them and it seem that there was way to much crust for a 9×12 pan. There is 3 sticks butter and 3 cups flour. Is the pan size correct? I used two pans and this seemed that this was enough crust. Please let me know your thoughts. Yes, the pan size and amount of crust is correct. But the thickness of the crust is also a personal preference, so if it seemed like too much for you, using less or using 2 pans is another option. I agree. Crust was too thick in ratio to filling. Will cut that part down next time! Disappointed with this recipe, I pick this ‘best recipe’ because of the crust to filling ratio. I baked them last night and ended up having to cook the bars an extra 15 minutes because the pan was so ‘jiggly’ after checking them. I then worried all night I may have ‘burnt’ them. When to cut them today and ended up only being able to use the outsides of the pan, the inside when cut didn’t hold its shap whatsoever. Not sure what went wrong, checked and double checked the recipe when making it based on others comments. Omg – these really are the best lemon bars ever! Just made these for my adult grandson’s birthday and I’m hoping he loves them. I tasted the filling on the way to the oven and it was to die for. Thanks for the recipe Danelle. 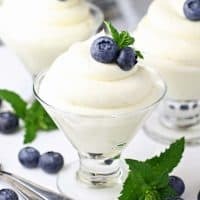 I made this recipe without making any changes. First of all, I baked the crust for almost half hour before it was done. The crust doesn’t have much flavor at all. The lemon filling is just ok. Ina Garten’s lemon bars are much better. Sorry. I just made these. They are in the oven now. Can’t wait to taste them. These look great. I love lemon bars! I was wondering if you (or anyone else – I am a huge fan of crowdsourcing!) 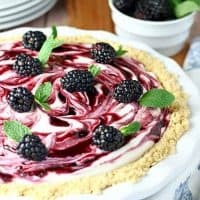 have any suggestions for an alternative low cal crust (relatively speaking, at least? Or do you think there mightbe a way to pull this off crustless?? Maybe as a cup? Crust is nice to have, as no utensils are needed to enjoy, but the lemon layer is what I adore and i dont mindcleaning a few spoons! I dont bake very often, so i dont have very many substitutions in my ‘baking kit’. I’m about to try your no-bake black forrest cheesecake, fyi, which also looks amazebees! This is Ina Garten’s lemon bar recipe! The only difference is you use 1-1/2 times her recipe’s crust ingredients for a thicker crust. Love Ina’s recipe. Will have to see if your thicker crust variation improves the flavor ratio or makes it too much like a heavy shortbread cookie. I just made these at 35 minutes middle seemed too jiggly, shut oven off and left in for 10 for minutes, seems solid now. Smell delicious, hope they taste as good as they smell.